If I were Mary Beard I’m sure I could tell you about my particular current predicament with grace and self-deprecating humour. As it is my reaction is a severe case of impostor syndrome when perhaps I should be swanning around with delight. But yet to talk about such delight makes me feel in danger of exhibiting unsuitable over-confidence verging on arrogance. Perhaps this is even a case of a #humblebrag. What’s prompted all these inner devils to get loose again? Well, this picture might give a clue. 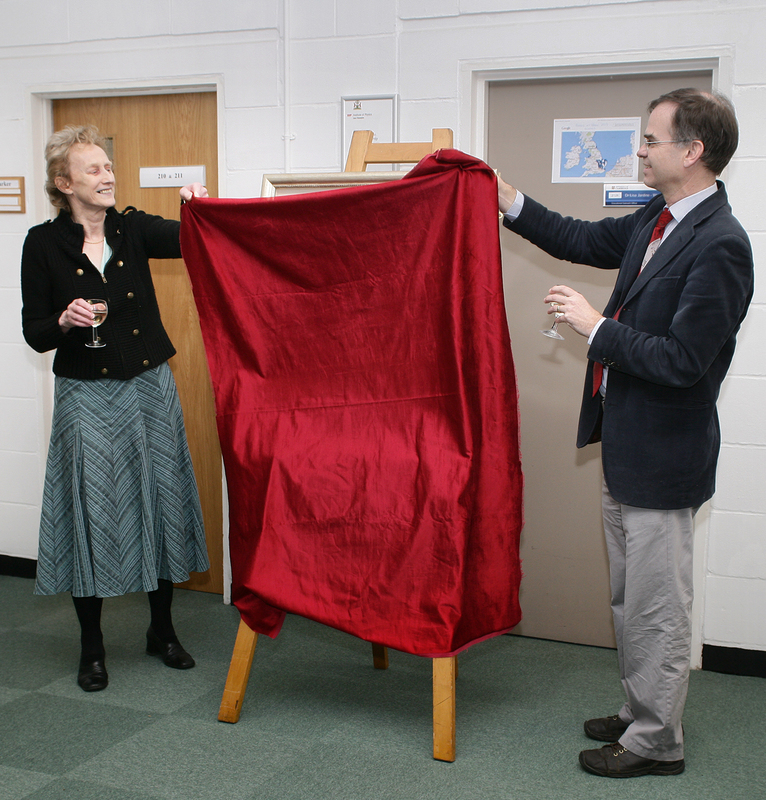 The moment of unveiling, with my Head of Department Andy Parker. If my seven-year old self could have imagined where I would be 50+ years later, I don’t think I’d have considered the possibility I would be standing, glass of champagne in hand, next to a portrait of myself. The picture (and for copyright reasons I’m not sure I can show you the finished work of art, a delightful picture by Tess Barnes, but her website shows her characteristic style) has now been hung on the stairs outside the lecture theatre adjacent to two of the Cavendish Professors (i.e the senior professor of the day) from my lifetime of research: Sir Sam Edwards, my mentor and supporter (as exemplified by the sort of actions covered in my immediately preceding post) and his predecessor Sir Brian Pippard. I am deeply humbled to find myself in such august company, just across from Lord Rayleigh, he of ‘why the sky is blue’ fame an earlier Cavendish Professor and Nobel Prize winner. But, it is discombobulating to say the least, embarrassing and pleasing in roughly equal measure. As I walk past the portrait daily in the years ahead, which emotion will dominate on any given day will probably depend on my mood. Tess has been painting a series of portraits of female scientists for the past several years, with an eye to an exhibition to show the world that women and science mix, mix well and that we are interesting people whose characters shine through her artwork. The exhibition is intended to showcase equal numbers of male and female scientists, a powerful group of pictures when they go on tour, I hope inspiring another generation to think about what a scientist ‘looks like’ and whether therefore it looks like them. (Clue: it is unlikely to involve sticking up hair, test-tubes or a white lab coat.) Making sure that everyone can relate to these images of scientists is clearly close to her heart, although I fear the exhibition may be homogeneously white-skinned, a challenge to be resolved another day (I may be wrong on that count, as I only know the names of a section of her clientele.). Give students messages that allow them to resolve the conflict between their self-identity and their perception of the STEM-identity. Use adjectives the sort of people – their aptitudes – who work in STEM, as well as explaining what engineers ‘do’ , using verbs. To return to my own portrait. Hanging, as it now does, in a prominent position straight outside the department’s main lecture theatre, there is no doubt it will be seen by all our female students in their third and fourth years (for reasons associated with the geography of the city and teaching of the Natural Sciences Tripos, first and second years have their lectures in other departments). There are few portraits around, though lots of photographs, and there is no doubt it will be very conspicuous (pause for another bout of self-pinching and panic). At this point I have to think to myself ‘isn’t it wonderful that these young women will have a role model who isn’t an old man, merely an old woman.’ Hmmm, doesn’t yet feel a very comfortable thought. I am writing this post within the hallowed walls of the Royal Society which still has not refreshed its portraiture to reduce the overwhelming preponderance of men by even just a little, nor yet put into store pictures of lesser-known gentlemen with pith helmets – I believe literally although I’m no expert in this type of headwear – or bewigged (albeit not simultaneously). This refresh is on the cards and I for one sincerely look forward to a more welcoming bunch of individuals decorating the walls. The Cavendish, on the other hand, is well-served with photographs of individuals but has only a very limited number of paintings. The photographs are an amazing record of students past and present. And women are represented if you look hard, with splendid hats in the earliest days as seen below (1904 batch). The women are named but their history is not necessarily recorded: I have to assume they weren’t simply clerical assistants. As far as I know, the first woman to receive a PhD from the Department was Katherine Blodgett in 1926. 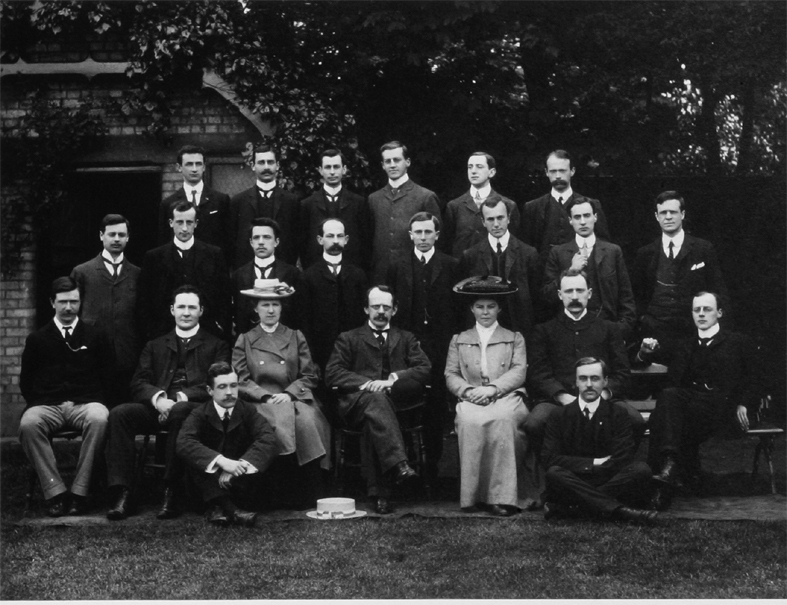 1904 Research Students: Photograph copyright Cavendish Laboratory. The one thing I regret about my portrait is that I have been painted holding a red felt tip pen, beloved by me for marking up student’s work (see my thoughts here). Unfortunately, if you don’t look too closely I could be thought to be holding a tube of lipstick, possibly not giving off the message I feel appropriate for who I am. I don’t suppose I have used such a thing since I was a teenager to the extent that I’m not even sure that lipstick is correctly described as coming in tubes. No matter. I assure you it is a pen, but you’ll have to wait for the exhibition itself (or a visit to the department) to check. This entry was posted in Science Culture, Uncategorized, Women in Science and tagged portraiture, role models, Tess Barnes. Bookmark the permalink. 7 Responses to Should I Be Discombobulated? Congratulations Athene on the portrait. Anything that helps redress the STEM gender imbalance can only be a good thing, and visible female role models definitely play a part in this. With hindsight, my daughter wishes she had applied to a girls college – at least there would have been a chance of meeting other aspiring female physicists amongst the candidates. Or at least some lipstick wearers. What I find such a shame is that I went through exactly these experiences 30 years ago – I stuck with it and read physics, in a dept with a male:female ratio of 10:1 – but how can it be that nothing much has changed since?! It seems that girls choosing STEM subjects, especially the maths-heavy ones, are still going to feel comparatively isolated in their daily lives. That’s a daunting prospect for a lot of young teenagers. K Wilson: I agree the situation is still depressing and can be isolating for girls in physics, as I’ve written about so many times before. I believe the problems start incredibly early and there is little universities can do when the percentage of girls in the A level cohort are so small (around 20-25%). Cambridge Physics has a similar proportion, so if your daughter gets in she will see other female faces around – and the department makes sure the undergraduates see female lecturers in every year of the course. We have hired several young women recently as Lecturers so there will be more and more role models around if she does come to Cambridge. The Institute of Physics does what it can (see this for some examples) but schools, family and the media have a huge influence on children’s choices. This cuts the other way for boys and biology of course. I think it is important for your daughter to realise that girls do belong, the Cavendish itself is very welcoming and aware (it is, after all, the only Athena Swan Gold Physics department in the country) and being in a minority is not the same as being unwanted. Girls colleges would of course mean there are plenty of other girls around – but they may not be reading Physics, since the numbers in those colleges remain low in the physical sciences. K Wilson – Just chiming in from the other side of the pond… We’re here! There are women, in heels, and lipstick, and workboots, and cleanroom suits, and whatever else. If she has concerns I’d encourage her to reach out to the department and ask. She can ask “I’m thinking of coming, but I have concerns about the gender balance in my cohort.” We need to hold our institutions accountable. A support mechanism is key. The geography makes it a bit hard, but I’d be happy to offer encouragement from way down the line, and perhaps try to help her find some support a little closer to home. Give me a holler if that helps (tuttle at utexas dot edu) or over on twitter (@niais). Congrats Athene, you’re an inspiration. Of course you should be in this prestigious gallery, no question! Hi Athene, As you know already tweeted my thoughts on your portrait! Just wanted to offer some supportive words to K Wilson. Hi K Wilson, I have read your comments and just wanted to share some experience I have as a parent of a daughter. Firstly the interviews are tough! This is true for anyone who has worked their socks off and actually managed to get an interview! So well done to your daughter! My daughter who is now 2nd year BioNatSci (I’m so proud), she also had 3 male interviewers even though for bio subject, so thought nothing of it. She also found the interview a pretty tough experience, but to be honest from what I can gather it is just to prepare them for what is going to be a very difficult and exhausting first 2 terms followed by an incredibly stressful 3rd exam term! x3 years! But I know that she wouldn’t change it for the world! As for the consideration of the college I can’t imagine it to be an issue as the students are so diverse, none of my daughters close friends are doing the same subjects as her anyway (compsci and 2 physNatscis, only one of which incidentally is also female). The split in Cambridge as a whole is pretty much 50/50. Also to note that my daughters partners in her practical’s are also male so even if she choose a different subject her exposure to the opposite gender would not be very much different. Something else to note is a recent conversation I had with my daughter about which subjects people choose, which reminded me how I felt at her age. People just pick subjects which they are interested in without consideration for much else! Maybe we are just stubborn people but I think we need to give teenagers more credit for how strong minded they actually are. Of course there is much to be said for role models etc (I expect it is you!) but the first part of this hurdle has already been overcome as your daughter has already decided on what she wants to do! My advice is not to focus on the gender issues (my daughter has experienced none at all!) but focus on the fact that she has just had a grueling interview and that she will need building up again to keep going with her A-Level work over Christmas, if she does manage to get that golden ticket (getting the letter is pretty much as awesome as when Harry Potter gets his letter from Hogwarts) then she will need to make sure she gets those results! She should also to be extremely excited as she will completely love her time at whichever college she attends! Wish your daughter the very best luck! Athene – wow, Athena Swan Gold, I’m impressed. The dept I work for has finally decided to aim for Bronze, but only after months of an increasingly paranoid email debate involving a sizeable minority of senior men (and there’s a lot of them, we are a ridiculously imbalanced workforce) who have chosen to interpret the Athena Swan initiative as a feminist plot to sack half of them and recruit women instead (I am not joking). 20 – 25% female physicists also seems (relatively) good – we have not seen quite that proportion at physics open days elsewhere. I agree that the crucial age is much earlier – I would say 12-13, when they start dropping some subjects at school. Computer Science seems to fare even worse than physics. My middle daughter is one of only two girls out of 40 doing the newly introduced GCSE. I just don’t get it – why would girls NOT want to spend their time knocking up their own versions of Candy Crush? Although I suspect parents are as much responsible as schools and peers for gender stereo-typing.